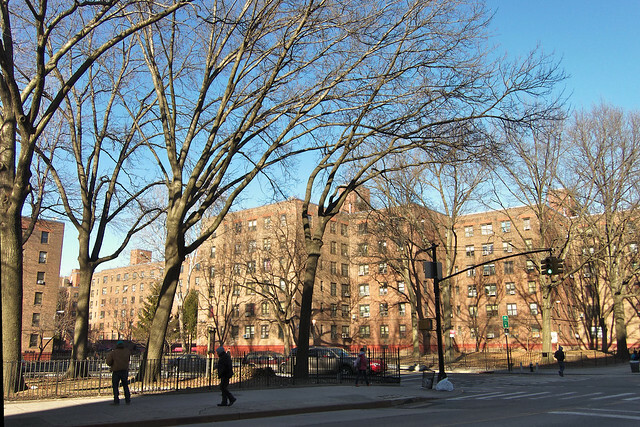 The Walt Whitman Houses, a public housing project in Fort Greene, Brooklyn. Source: Flickr/Francisco Daum. Welcome to the third episode of Here There Be Dragons, a podcast about safety and identity in cities. I spoke to seven New York natives from all over the city about their stories and experiences. The six episodes that follow will be released weekly on CoLab Radio. In the third episode below we hear New Yorkers reflect on public housing. Public housing, the projects, have a reputation in New York, even to people who’ve never been to the city. They are at once a low-income family’s best housing resource and places feared for crime and violence. Rumors of crime and incidents of violence make us forget that they are also homes, that they also have history that is deeply tied to city. This side of the projects is unfamiliar to even native New Yorker who often see the buildings for their broken windows and not the histories that live within them. Each person I interviewed for this podcast also drew a map of their childhood and adulthood in the city (see below). If you’ve visited or lived in New York and you want to share your experiences with me, download the base map, use the maps in our gallery as your guide and draw your own experiences of safety and danger in the city. And I’ll post them in the gallery. Send those to Jess Myers at (colabradio@mit.edu). You can also record a comment or question about the episode by calling into 1 888 821-7563 ext. 58258. Some of those might be a part of the final episode in the series. Post and podcast by Jessica Myers.